Italian designed and manufactured 24% Crystal this beautiful dish Keeps track of all those pesky things that seem to get lost so often, and never lose them again with this trinket box. The box is especially great for small costume or fancy jewelry. 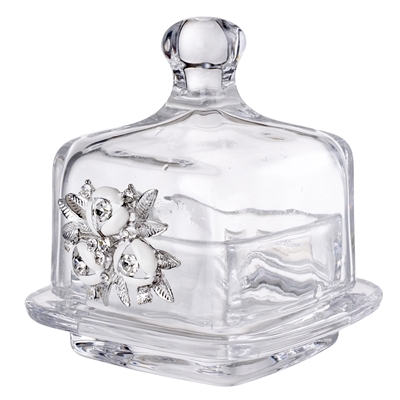 This trinket box is crafted from 100% Swarovski crystal and is finished with pearl accents. Give this trinket box as a gift for a newlywed, anniversary gift, wedding party gift idea, or that person that loses lots of earrings, or has more jewelry than they can keep up with. They will thank you for it and it will be less expensive for everyone else.